After the Mumbai attacks, first time a high level ministry talks were initiated yesterday on 15th July between India and Pakistan led by the foreign minister of Pakistan and External affairs Minister of India. India had earlier suspended all diplomatic channels with Pakistan and placed a condition on Pakistan that it will only resume talks when Pakistan government will take action on the perpetrators of Mumbai attacks which involved some top Pakistan based terrorists. Though David Headley who is under the custody of FBI had also named officers serving in Pak Army and ISI (Pakistan’s Intelligence Agency). On India’s this attitude Pakistan’s Foreign Minister Shah Mehmood Qureshi said that he was disappointed with India’s selective talks approach. His remarks came even before his counterpart and guest SM Krishna had left Pakistan which doesn’t look like a normal diplomatic behaviour. Pakistan once again wants to discuss on other issues including the issue of Kashmir and Balochistan where for past one or two years Pakistan has been blaming Indian intelligence agency (RAW) for the involvement in their age old problem of Islamic extremism directed against Pakistan. Though Pakistan has never shown any proof yet. Qureshi also disparaged S.M Krishna for attending calls from the New Delhi office. “Not once did I leave to take a phone call,” Qureshi added. 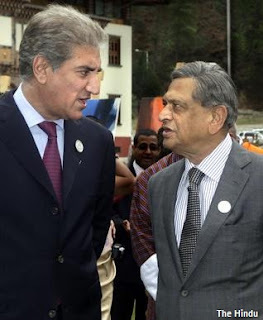 S.M Krishna surprisingly denied Qureshi remarks saying he didn’t attend any call during talks. Though India has a six decade old culture of democracy and knows the importance of suggestions by others before coming to any solid conclusion. But Pakistan outraged India, asking, “who is the actual foreign policy adviser for India?” and blamed SM Krishna, calling him unprepared and unwilling to continue the dialogue. The blame game was not over yet, the two countries which met to sort out their differences and initiate a peace call actually ended up widening the gaps between them as the remarks from Pakistan ministry became personal attacks on the Indian team. It all started with a comment by India’s Home secretary G.K. Pillai, on ISI’s role in Mumbai attacks when asked what Pakistan is doing to curb the mastermind of Mumbai attack and Hafiz Saeed from making hate speech against India. Qureshi blamed G.K Pillai and equated his remarks with Hafiz Saeed hate speech against India even when G.K Pillai was saying something which came out from the separate interrogation of David Coleman Headley by India and FBI. Indian side was surprised to see Qureshi comparing an International Terrorist’s words with the words of India’s Home secretary supported by strong, reliable references. At the end of the day talks failed, but at least they tried. Whose fault was it let us not think about that, if we start analyzing this, new and new differences will be created. Hence let us avoid this and start again. Indian side is so stiff for talks because it cannot tolerate any other such attacks which if Pakistan wants can be stopped, and if Pakistan is also the victim of the same terrorism India is ready to help.